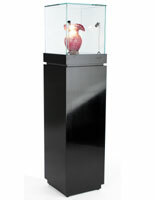 Looking for a showcase with lights that will fit in any retail store or museum? 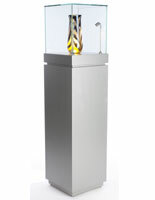 These pedestal-style display cases with spotlights feature a unique style of illumination with tilting LEDs. This type of showcase is great for creating centerpieces in both commercial and artistic environments. Shops can use the display cases with spotlights to promote high value merchandise like electronics, art pieces, jewelry and collectibles. With these cabinets, galleries can make vases, sculptures and other visual artwork. The display cases with spotlights can also be placed in the home for showing off valuables like family heirlooms and keepsakes. 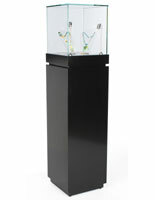 Our pedestal cabinets have a single showcase area surrounded by tempered glass for exhibiting curios and wares. However, the display cases with spotlights also have a hidden storage compartment and a shelf, both of which lock. These concealed areas can be used to keep supplies and merchandise out of sight to prevent theft. In addition, the stands’ two LED lights can tilt to accommodate items of different sizes. Offered in neutral finishes, these display cabinets will blend into any interiors’ décor.